Since beginning the inaugural season of The Orchestra Now (TON), many of our friends and musical acquaintances have asked us the same question, “So what is this new program you’re doing?” And to be completely honest, for a while, we had no idea how to respond. It seemed like a professional orchestra and then it seemed like school and then magically it started making sense. But how do you explain such a multi-faceted program in a short blog post? Our aim is to give you a glimpse into our lives in this program from the beginning to the present – only a brief period of four months, but a period of time in which so much has evolved and been realized. In early 2015, we were both enjoying our busy lives, but achieving our goals was becoming increasingly difficult as we ran between random gigs and worked in retail hell. We were in survival mode and losing sight of our ultimate goal: to win positions with full-time orchestras. As post-graduate musicians who had already completed formal studies, we started freelancing and teaching, but felt something was missing and kept questioning ourselves: how were we supposed to transition from being students to professionals overnight? How were we supposed to fit into the ever-changing world around us, yet also fit into the current world of classical music, a world of tradition that is slow, even hesitant, to change? So, it was with great excitement and trepidation that we signed on to play in TON. Over the past 150 years, tradition has played a large role in how we develop our skills and careers as musicians. Nearly every conservatory in the United States uses methods borrowed from the Paris Conservatory: intense solfege instruction, meticulous music theory courses, and concours style (competition/jury) examinations. European players trained under this system, came to the United States, taught our teachers, and they taught us. Today, the place of music in society is very different even from 50 years ago, and the reality of the musical legacy we will impart to our students is going to be much different from that of our teachers. We must take everything our teachers have given us, using tradition as a base to create our futures, however, we cannot rely solely upon it. The Orchestra Now (TON), a new program of Bard College, is geared towards creating an environment for pre-professional musicians to hone their craft in an orchestral setting, but also, and more importantly, to learn how to develop and engage a 21st century audience. In addition to the orchestra’s rigorous concert schedule, the thirty-six member inaugural class is immersed in an innovative Master’s degree program that focuses on building curatorial skills in an open, old school style seminar setting. Panel discussions and lectures in the seminar cover a broad range of topics such as the music being played in the orchestra, history, art, literature, and films – a “potpourri” of topics. The following day in our breakout sessions, we either go more in depth about what we discussed the day before or have our own panel discussions about our place in the classical music world, I.E. crafting a dossier, CV, or Resume; learning other genres of music to inform us more about classical music; or how to market a group, among much more. It is exciting and inspiring to know the people around us want to explore these ideas and find them as important as we do. Guest Lecturer and NYC-based harpist Bridget Kibbey leads a course, Inside the Musician’s Studio, which focuses on the entrepreneurial side of music. Guest presenters from the “business” and artists who have created their own brands come to speak about their careers and challenge us to explore other components of sharing our music. Next semester, Bridget will be helping us begin ideas for our capstone: the project that we will all complete in the third year of study. This class forces us out of our comfort zones, pushing us to focus on very seldom-covered parts of the industry. Concert-wise, we have not strayed too far from tradition yet, as it is the inaugural year. However, the changes we have been implementing so far have been really worthwhile, not only to us but also to our growing audiences. The most important thing for concertgoers is that they hear their old favorites, so it is our job to broaden their musical spheres by programming lesser-known repertoire. They listen to pieces they know in an autopilot mode, but with new pieces, they listen more fiercely, trying to dissect it and make sense of it. The pieces don’t have to be the most profound, they just need to be strategically programmed and say something interesting that appeals audibly. In addition to the under-played repertoire TON is presenting this season, concertgoers also experience masterpieces like Beethoven’s Eroica Symphony in a new way. 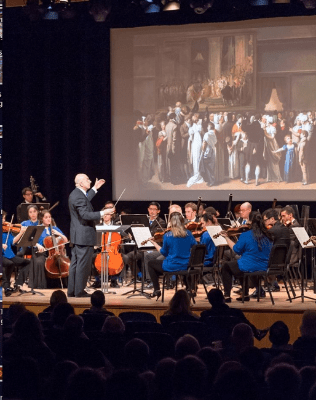 In collaboration with the Metropolitan Museum of Art, The Orchestra Now presents a new concert series titled Sight and Sound, which showcases works of art paired with musical masterpieces. The concert begins with a lecture during which excerpts from the program are played alongside a visual slideshow, bringing context through art and history to the piece, followed by a full performance in the second half. The first of these concerts was held in December of 2015 and focused on Beethoven’s Eroica Symphony and Louis Leopold Boilly’s The Public Viewing David’s “Coronation of Napolean” at the Louvre (from the Met Gallery). Napolean, the “hero,” Prometheus, death, and nature were discussed while paintings by Boilly and his contemporaries were projected above us. After the performance concluded, microphones were placed throughout the audience, giving listeners the chance to ask questions and interact directly with the conductor and musicians. The Orchestra NOW at the Met Museum, 2015. Photo Credit: David DeNee. During every intermission of every performance, TON musicians go into the lobby and talk with audience members. It’s confusing for some at first, but nearly all the concert goers quickly warm up and want to have a conversation about what they just heard, who we are, what the program is about, or when our next concert will be. Having had the opportunity to speak with audience members during the intermission at the Metropolitan Museum, the question and answer session after the performance helped further break down the barrier between us and the audience. Additionally, TON has been experimenting with the European entrance – a bone of contention for many musicians. At first, I think nearly everyone was adamantly opposed to the idea. After a few concerts oscillating between the traditional sit-on stage and European entrance, it is now evenly divided between likes and dislikes. There is something about it, though, that creates a nice sense of ensemble unity and a clean presentation for the members of the audience. Let’s face it, universities and conservatories have a limit to how much they are able to prepare young, aspiring musicians. Their sole focus is the formation of these young individuals, helping to guide them and give them all the necessary tools they need to be the best at their craft as possible. Only so much training, however, can actually prepare us, the aspiring professional musician, for what is coming next. We are not taught about what life is going to be like after graduation and, more often than not, are left floundering and questioning ourselves and our place in the music world when that day comes. The limited number of job openings mixed with the declining popularity of the orchestra and classical music puts our generation of musicians in a precarious position. In Europe, training orchestras are associated with nearly every orchestra, helping further develop young professionals after school. The U.S. has but one successful full-time training program, New World, which has become a pillar for aspiring orchestral musicians to begin and create a life post graduation. The training orchestra is an important stepping-stone for those of us who are in the last stages of our formative, formal education; it is a vehicle to help us transcend being a student to being a professional. After reflecting immensely about the last semester, we realized that the goal of the program – after many discussions and panels with experts and our own faculty members – is for the next generation not to ride on the coattails of what has come before, but to create something new, fresh, and intriguing; to find ways of sharing classical music with a new audience; to find a way to make classical music accessible to people of all walks of life, and to show them that it is like popular music. If we keep to tradition, we’ll have nothing but that. If we keep to tradition, we’re only silencing ourselves in a way. TON aims to help create a musician who not only can play, but one who can lure and intrigue his own contemporaries. We are being shown after much intense musical training how to be whom we want within ourselves and within our art. Nina Simone said, “How can you be an artist and not reflect the times?” It is not our job to just play music anymore, like our teachers have before us. It is about taking another less-travelled path, drawing upon what we have learned so we can present music, teach about it, and infuse it into the everyday lives of the people around us in a new way, a way that makes classical music relevant to us, our society, and our time. As this program matures it will most certainly carry major clout in the music world, securing a reputation of innovatively preparing musicians for varied, multi-faceted careers, unlike any program before. Thomas James Wible has been a concerto soloist throughout the USA and Europe. He is the 2013 First Prize Winner of the James Pappoutsakis Memorial Flute Competition and has given solo recitals at Boston’s Jordan Hall and New York’s Carnegie Weill Recital Hall. Oboist Zachary Boeding enjoys an exciting performing career throughout North America as a recitalist, orchestral, and chamber musician. By way of eclectic and non-traditional programmation, he aims to make classical music accessible to everyone. His current project, UNmute, mixes existing chamber music and commissioned works with silent films.